Photograph: James Bynum - Used with permission. Welcome to Pennsylvania, the birthplace of independence and the Constitution. In 1681, when King Charles II granted William Penn, a Quaker, the vast tract of land that includes present-day Pennsylvania, the grant had strings attached: Penn was required to repay the king by sending him two beaver pelts a year! Penn and the Quakers found refuge from religious persecution here, and the land became a haven for others too, including Mennonites and Amish. Primarily of German descent, these "Pennsylvania Dutch" settled in and around Lancaster County. Adhering to a simple way of life, the Pennsylvania Dutch still live in the state's tranquil farmland settings, shunning many of the conveniences of modern America in favor of slower, more peaceful ways. It is common to see a plodding horse and buggy on the state's country roads, driven by plainly-dressed people living a simpler, slower way of life. Pennsylvania welcomes visitors with open arms, and boasts that over 5 million tourists a year come to the peaceful Lancaster County area to partake of a more relaxed lifestyle, beautiful landscapes, and charmingly hospitable people. A keystone is a central wedge in an arch that locks all other pieces of an arch in place. It is the part of an arch that all other parts depend upon. Pennsylvania's popular nickname, "The Keystone State," refers to this necessary element. Like most nicknames, it is not known, for certain, where this name originated, but there are a few interesting thoughts about how this nickname came to be. They are all based on the theme of the necessity of a keystone in a supporting structure. 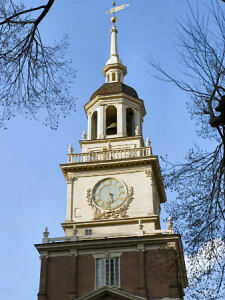 In the vote for independence, nine delegates to the Continental Congress were from the Commonwealth of Pennsylvania. It's said that the Pennsylvania delegation was split; four for independence and four against. The deciding vote fell to John Morton.... who voted for independence. 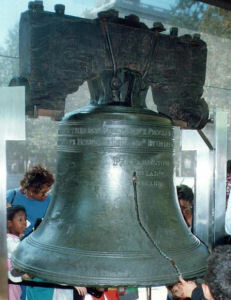 Pennsylvania's vote for independence was noted as the keystone vote; the supporting vote for a new government. When the government was moved to Washington, D.C., a bridge was built over Rock Creek to Georgetown. This bridge was the Pennsylvania Avenue Bridge. Pennsylvania's initials were carved into the "keystone" of the arch supporting the bridge. Another explanation has it that Pennsylvania's geographic location, among the original thirteen colonies, was the basis for this nickname. Though the nickname's origin is unknown, it's certain that it was in use around, or shortly after, 1800. It's reported that Pennsylvania was toasted as "...the keystone of the federal union" at a Republican presidential victory rally for Thomas Jefferson in 1802. Regardless of its origin, the nickname has come to represent Pennsylvania's geographic, economic, social and political impact on development of the United States. Pennsylvania is sometimes called "The Quaker State" in reference to the religion of William Penn and the Quakers who settled in the state. Coal mining, one of Pennsylvania's greatest industries, was the reason for this nickname. Another Pennsylvania industry, steel, is represented by this nickname. People who live in Pennsylvania or who come from Pennsylvania are called Pennsylvanians. The second state quarter minted in 1999, under the United States Mint's 50 State Quarters® Program, was that of Pennsylvania, the "Keystone State". The Pennsylvania quarter shows the state's keystone, Commonwealth statue, and state motto "Virtue, Liberty, Independence" atop an outline of the state. The Commonwealth statue has been on top of the state's capitol dome since May 25, 1905. Her right arm is extended in mercy; her left arm holds a ribbon mace to symbolize justice. Pennsylvania (From Sea to Shining Sea) , by Barbara A. Somervill. 80 pages. Publisher: Scholastic Library Publishing (February 2003) Reading level: Grades 3-5. Presents information about Pennsylvania's people, geography, history, landmarks, natural resources, government, state capitol, towns and cities, and more. Pennsylvania (World Almanac Library of the States) , by Scott Ingram. 48 pages. Gareth Stevens Publishing (January 1, 2002) Reading level: Grades 4-6. Filled with the most up-to-date information, including the latest Census results. Full-color photos bring to life the story of Pennsylvania. In addition to an in-depth factual profile of Pennsylvania in the form of a state Almanac, this book offers fascinating and lively discussions of the state's history, people, geography, government, economy, culture, and lifestyles. A section on Notable People, a calendar of events, and enough primary source documents, time lines, maps, and other tools to make this unquestionably the best young adult reference material on the USA available anywhere. A History of Pennsylvania , by Philip S. Klein. 648 pages. Publisher: Pennsylvania State University Press; 2 Enl Sub edition (October 1980) Acclaimed as the standard history of the Keystone State, this book has been updated to cover the 1978 gubernatorial election as well as other developments - political, economic, social, and cultural - during the six years since publication of the original edition.Dozens of new illustrations have been added throughout the book, and both the text and the chapter-end bibliographies take account of significant recent scholarship. Pennsylvania: A History of the Commonwealth , Edited by Randall M. Miller and William Pencak. 712 pages. Publisher: Pennsylvania State University Press (October 2002) Co-published with Pennsylvania Historical and Museum Commission, Pennsylvania: A History of the Commonwealth offers fresh perspectives on the Keystone State from a distinguished array of scholars who view the history of this Commonwealth critically and honestly, using the latest and best scholarship to give a modern account of Pennsylvania's past. They do so by emphasizing the evolution of Pennsylvania as a place and an idea. The book, the first comprehensive history of Pennsylvania in almost three decades, sets the Pennsylvania story in the larger context of national social, cultural, economic, and political development. Without sacrificing treatment of the influential leaders who made Pennsylvania history, the book focuses especially on the lives of everyday people over the centuries. It also magnifies historical events by examining the experiences of local communities throughout the state.